The St. Augustine movement was part of the wider Civil Rights Movement in 1963–1964. It was a major event in St. Augustine's long history and had a role in the passage of the Civil Rights Act of 1964. Dr. Robert Hayling is generally considered the "father" of the St. Augustine movement. A Tallahassee native originally, Hayling served as an Air Force officer, and then became the first black dentist in Florida to be elected to the American Dental Association. He set up business in St. Augustine in 1960 and joined the local National Association for the Advancement of Colored People (NAACP). The organization led a high-profile protest of the segregated celebration of the city's 400th anniversary in March 1963. While the campaign was successful at convincing Vice President Lyndon B. Johnson to speak before an interracial audience in St. Augustine, it had no effect on the overall Jim Crow laws. The NAACP campaign lacked a direct action component and Hayling believed that this was a major failing. Hayling founded an NAACP Youth Council that engaged in nonviolent direct action, including wade-ins at the local segregated swimming pools. From May until July 1964, protesters endured abuse and verbal assaults, usually without any retaliation, although this time police were often intervening to prevent violence between protesters and counter-protesters. The movement engaged in nightly marches down King Street. The protesters were met by white segregationists who violently attacked them. Hundreds of the marchers were arrested and incarcerated. The jail was filled, so subsequent detainees were kept in an uncovered stockade in the hot sun. When attempts were made to integrate the beaches of Anastasia Island, demonstrators were beaten and driven into the water by segregationists. Some of the protesters could not swim and had to be saved from possible drowning by other demonstrators. The demonstrations came to a climax when a group of black and white protesters jumped into the swimming pool at the Monson Motor Lodge. In response to the protest, James Brock—who was the manager of the hotel, in addition to being the president of the Florida Hotel & Motel Association—poured what he claimed to be muriatic acid into the pool to burn the protesters. Photographs of this, and of a policeman jumping into the pool to arrest them, were broadcast around the world and became some of the most famous images of the entire civil rights movement. On June 30, Florida Governor C. Farris Bryant announced the formation of a biracial committee to restore interracial communication in St. Augustine. 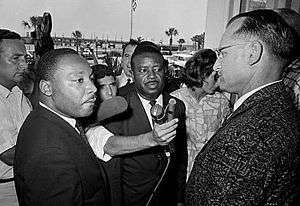 Although matters were far from resolved, national SCLC leaders left St. Augustine on 1 July, the day before President Lyndon Johnson signed the Civil Rights Act into law. Despite this national success, black residents in St. Augustine continued to face violence and intimidation. Consistent threats and picketing by the Klan led many of the town’s businesses to remain segregated. Although SCLC continued to provide some ﬁnancial support to activists in St. Augustine beyond July 1964, the organization never returned to the city. With his dental practice financially destitute after the loss of his white patients, and the safety of his wife and children uncertain, Robert Hayling decided to move to Ft. Lauderdale, Florida, in 1966. The black Florida Normal Industrial and Memorial College, whose students had been involved in the protests, felt itself unwelcome in St. Augustine and in 1965 purchased a tract of land in Dade County, moving there in 1968. The school is today Florida Memorial University. The motel and pool were demolished in March 2003, despite five years of protests, thus eliminating one of the nation's important landmarks of the civil rights movement. A Hilton Hotel was built on the site. In 2003, nearly four decades after Robert Hayling left St. Augustine, the city’s mayor issued a Certificate of Recognition for Hayling’s "contributions to the betterment of our society," and a street was named after him. ↑ Civil Rights Movement Veterans. "St. Augustine FL, Movement – 1963". ↑ Civil Rights Movement Veterans. "St. Augustine FL, Movement – 1964". ↑ Augustine.com – "Black History: Dr. Robert B. Hayling"
1 2 3 4 Branch, Taylor (1998). Pillar of Fire. Simon & Schuster. ISBN 0-684-80819-6. ↑ United States Commission on Civil Rights, 1965. Law Enforcement: A Report on Equal Protection in the South. Washington, DC: Government Printing Office, p. 47. ↑ Duncan, Gwendolyn (2004). "Dr. Robert B. Hayling". Civil Rights Movement Veterans. ↑ Civil Rights Movement Veterans website, "Timeline- 1963: The St. Augustine Movement"
↑ Garrow, David (1986). Bearing the Cross. Morrow. ISBN 0-688-04794-7. ↑ Bryce, Shirley (2004). "St. Augustine Movement 1963–1964". Civil Rights Movement Veterans. ↑ US Senate: Art and History "June 10, 1964-Civil Rights Fillibuster Ended"
↑ "Our History", http://www.fmuniv.edu/about/our-history/, retrieved May 4, 2016. ↑ Griffin, Justine (2011). "City unveils Foot Soldiers monument". The St. Augustine Record. ↑ Welch, Casey (2011-05-10). "Walking Tall". Folio Weekly. Colburn, David R. (1985). 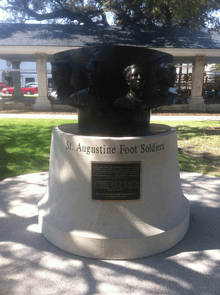 Racial Change and Community Crisis: St. Augustine, Florida, 1877-1980. New York: Columbia University Press. ISBN 9780231060462. Eubanks, Gerald (2012). The Dark before Dawn: From Civil Wrongs to Civil Light. Bloomington, Indiana: iUniverse. ISBN 9781475955576. Garrow, David J., ed. (1989). St. Augustine, Florida, 1963-1964: Mass Protest and Racial Violence. arlson Publishing, Incorporated. ISBN 9780926019065. Smith, James G. (2014). Before King Came: The Foundations of Civil Rights Movement Resistance and St. Augustine, Florida, 1900-1960. (MA Thesis) University of North Florida. Warren, Dan R. (2008). If It Takes All Summer: Martin Luther King, the KKK, and States' Rights in St. Augustine, 1964. Tuscaloosa, Alabama: University of Alabama Press. ISBN 9780817380663. St. Augustine's Civil Rights Movement A video with Professor Michael Butler, faculty member of the Humanities Department at Flagler College, as presenter. He discusses the history of the Civil Rights Movement in St. Augustine, Florida. Published March 25, 2015 on C-SPAN; about 26 minutes.